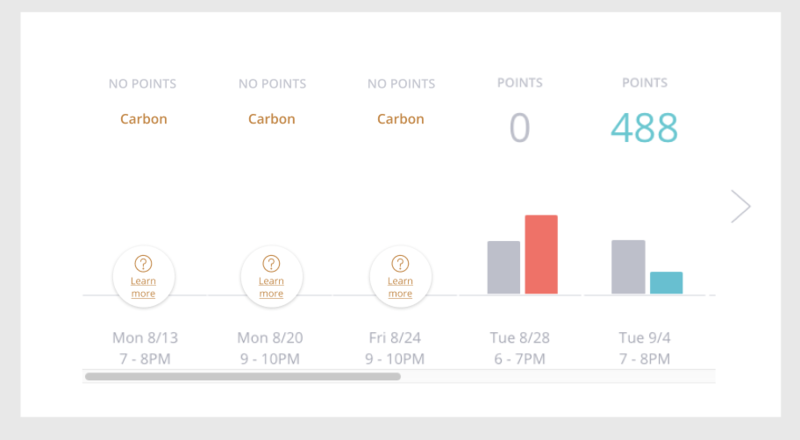 What does "No points, Carbon" mean on my performance dashboard? I see "Carbon, No Points". What does that mean? You'll see "Carbon, No Points" on your #OhmHour Dashboard if you were at Carbon status at the time of an #OhmHour, but are now at Silver or above. 1. You are not yet utility connected, or were not utility-connected at the time of this #OhmHour. Even if you connected your OhmConnect account to your utility account upon signing up with us, you utility may not have confirmed your enrollment and started sending us your meter data. Check out the Utility Details section on your settings page to see if we are now able to establish a connection with your energy meter. If not, contact us, and we'd be happy to help you. Note that once you are utility connected, we look at the preceding 2 weeks of #OhmHours and award you points for your energy savings. No tears lost here! 2. You moved, and we lost connection to your meter data. When we no longer receive meter data for 21 days, you're dropped down from Silver+ status until your meter data arrives again. Then, we look back 2 weeks and recalculate these #OhmHours as if you were Silver+ status. Find out how to update your address if you've moved. 3. There was an issue with your utility enrollment. First, visit your Utility Details section on your settings page to see if we're able to establish a connection with your energy meter. Then, if it's unclear why we're not getting your data, contact us. We're happy to assist you!